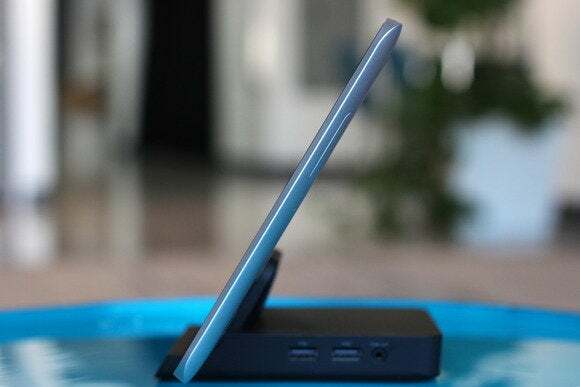 Seen here in its dock, the ElitePad 1000 G2 is fairly thin for a Windows 8.1 tablet. Make it better and they will come. That’s a common vendor mantra, but rarely are the improvements as compelling as those on HP’s $800, 10.1-inch ElitePad 1000 business tablet. 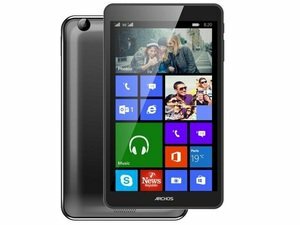 The successor to the ElitePad 900 replaces the single-core Intel Atom Z2760 with a significantly faster quad-core Intel Atom Z3795 CPU, features a higher-resolution display (1920x1200 versus 1280x800), and has twice the memory at 4GB. Those adds alleviate just about every complaint we had about the ElitePad 900—without killing what we liked about it. Even the battery life has improved. Part of what we already appreciated are the rugged Gorilla Glass 3 covering the display and the milled aluminum edge and backplate. The ElitePad 1000 is designed to meet the MIL-STD810G (military) standard, though I doubt it would last long in my god-daughter’s backpack. Kidding—even she would have a hard time dinging this thing. While the ElitePad 1000’s display looks great during everyday use and rendering movies, I noted uneven backlighting around the edges when the ElitePad 1000 was powering up. It’s noticeable only with a solid-dark background, and I quickly forgot about it. But 2.3 million pixels in only 10.1 inches of diagonal display space makes for some rather tiny icons, text, and window elements. I goosed them up all the way using the “change the size of all items” slider, but I finally had to resort to increasing the text size for individual elements. The ElitePad 1000 G2's dock features a standard d-sub, HDMI, Gigabit Ethernet, four USB and a Kensington lock port. If you want semi-rugged, accept that your tablet is going to be a bit heavier than the norm—a small price to pay for survival on the road. At 1.5 pounds, the ElitePad 1000 is an ounce or two heavier than the 900, but still relatively easy to carry around. It’s a little too heavy to hold single-handed for any length of time. With both hands, arm fatigue is minimal, but it’s best propped up on your stomach or docked. Subjectively, Windows 8.1 feels lively enough on the ElitePad 1000—at no time did I feel impatient waiting for windows to open or files to save. The PCMark results bore out that impression: 1595 on the creative test, 2399 on the work test. Battery life clocked in at a cool 8 hours and 16 minutes. It also handles 1080p video with aplomb, playing my 30GB rip of Master and Commander with nary a hitch. When you start to accessorize any tablet to this degree, you have to ask yourself why you’re buying a tablet rather than a laptop. Wireless connectivity on the ElitePad 1000 includes 802.11 a/b/g/n, Bluetooth, and broadband modules. While 802.11ac would be nice, 802.11n is acceptable. Alas, when it comes to physical ports, the unit is hurting. A headset jack, MicroSD and SIM card slots hide behind a panel that pops open when you press the recessed release button with a paper clip. That’s it. There are, however, a variety of accessories to compensate. Slide the unit into the optional $149 ElitePad Docking Station and you have four USB 2.0 ports, HDMI and VGA out, as well as an audio line out. It’s a bit bulky, but it’s nice to have around. 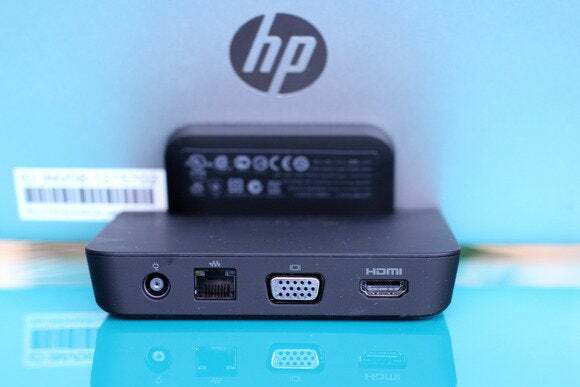 You may also opt for the smaller $49 HDMI/VGA dongle, $39 ethernet adapter, and $29 USB adapter, which are easier to pack, if not as convenient. There’s also a $249 productivity jacket with a full-size keyboard, USB ports etc. and a $149 battery jacket that will ratchet up runtime to about 20 hours. However, both add considerably to the ElitePad 1000’s 0.36-inch thickness and weight. When you start to accessorize any tablet to this degree, you have to ask yourself why exactly you’re buying a tablet rather than a laptop. HP moves to Intel's quad-core Atom Z3795 and doubles the RAM over its predecessor. Storage also continues to be a problem. Our unit came with a 64GB in eMMC which is probably the bare minimum for even a business-class tablet in terms of space. Fortunately, HP sells a model with 128GB too. Oddly, after touting the ElitePad 1000’s ruggedness, HP’s warranty for it lasts only a single year. A variety of paid support plans to add up to five years of protection. The ElitePad 1000 is also fully decked out with HP’s business-targeted software bundle, which includes Trust Circles, Client Security Manager, and Device Access Manager. It doesn’t get much better than the ElitePad 1000 in a Windows 8.1 business tablet, and kudos to HP for improving what needed to be improved without drastically increasing the weight. It’s fast enough, lasts long enough, and has a capable set of accessories. HP has updated its ElitePad with a higher resolution screen and faster CPU while keeping the milspec rating intact. 64GB eMMC isn't fast nor much space on our review model. No USB ports on tablet itself.